Musical Connections musicians perform with teaching artists Sarah Elizabeth Charles and Camila Meza at Sing Sing Correctional Facility in 2017. "I didn't know what a 'a flat' was," says Joe, one program participant (the Department of Corrections requests that last names of inmates not be published.) "I've heard these terms. I couldn't have explained them to you. I didn't know what they sounded like. I didn't know what they meant." Joe has now been in the program for four years. He studies music theory and is working with opera singer Joyce DiDonato on an opera score of his own. The program is run by Carnegie Hall's Manuel Bagorro, who oversees similar programs in shelters and community centers and says music is a form of rehabilitation for the participants. "People have come together, they play together," Bagorro explains. "They negotiate artistic decisions. They sort out problems, but all with enormous affection for music." The inmates take these negotiation and problem-solving skills with them after being released. Danny, a former Sing Sing inmate, was released three and a half years ago after seven years in the prison system. He learned the violin and started writing music thanks to the program and says that being a part of it changed the way he sets and accomplishes goals for himself. "I was able to take that same drive and the same dedication that it takes to learn a musical instrument and to compose into other areas of my life," Danny says. Kenyatta, another member, has be in Musical Connections since it started nine years ago and knows the craft he's learned has helped him open up to others. "This really has been pivotal in helping me," Kenyatta says. Kenyatta will be eligible for parole next year, but for the members of the workshop who have been released from Sing Sing, Carnegie Hall hosts a monthly meeting moderated by jazz trombonist Chris Washburne. Washburne says this is just the beginning. "I'm trying to tell these guys, 'Let's think as big as possible,'" Washburne explains. "So, our next goal is to write a bunch of music and take it back into the inside and make a real musical connection from the outside to the inside." Listen to the story in the audio link and stream to the song "Holding Out Hope" by Musical Connections program member Kenyatta below. Let's head about 50 miles north of New York City now to the maximum security prison known as Sing Sing. It's probably not the place you'd expect to find a flourishing music community, but for the past nine years, it's been home to workshops run by Carnegie Hall. 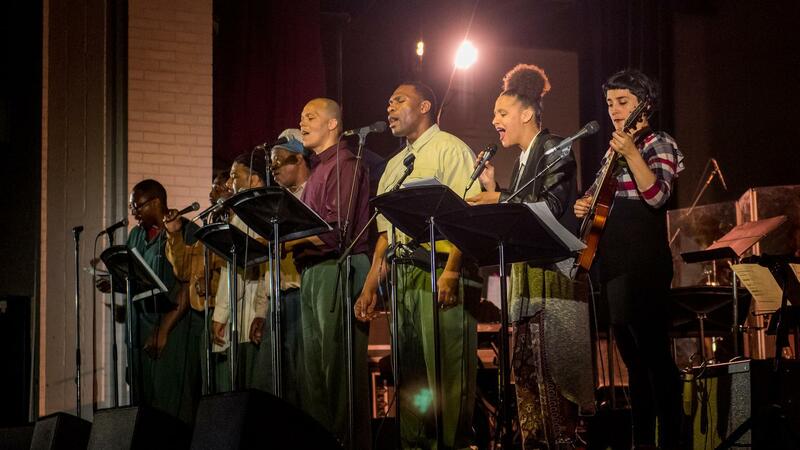 Last Saturday, former inmates performed their music on the hall's main stage. Jeff Lunden has more. JEFF LUNDEN, BYLINE: Sing Sing Correctional Facility opened in 1828, and there's still a kind of Victorian severity to it, from the rusty iron bars to the dimly-lit corridors where prisoners in drab green jumpsuits are led by guards who now communicate by walkie-talkie. There are 1,600 inmates at Sing Sing, and deputy superintendent for program services, Lesley Malin, says the staff is always thinking about the day they'll get released. LESLEY MALIN: Because most of the inmates are going to go home and be your neighbor and be my neighbor at some point. So we take a look at, what are some of the things that they need before they go? We have an associate's degree program, a bachelor's degree program, a master's degree. LUNDEN: And a music program. UNIDENTIFIED SINGERS: (Singing) Hold on. Hold on. LUNDEN: Twice a month, artists from New York City come to Sing Sing and spend a day giving the 30 inmates enrolled in the Musical Connections program formal training. Before it started nine years ago, Sing Sing had a music room, but Rob (ph) - the Department of Corrections asks that we don't use any last names or say what brought these men to prison - says there were often fights about who could use the room. ROB: Where we had fragmented fighting groups, now all these guys are part of this weird cohesive thing where we have to play together. And we're - all of a sudden, we're doing instant duet, me and somebody who hates me. But we're communicating musically. How long can we go on hating each other when we're helping each other with the score or sharing a piece of music? And we're all kind of struggling to keep up, you know, with everybody else. LUNDEN: Rob has been on parole for the last year and a half after spending seven years in Sing Sing. He played just two open mics before he went in. Joe (ph) had even less experience. JOE: I didn't know what A-flat was. I've heard these terms. I couldn't have explained them to you. I didn't know what they sounded like. I didn't know what they meant. JOE: She definitely opened my eyes to something that I didn't even know I had within myself after I met Joyce and I started to actually listen to classical music because, before that, I didn't listen to any classical music. LUNDEN: Now he collects opera scores and is writing one of his own. LUNDEN: The Musical Connections program is run by Carnegie Hall's Manuel Bagorro, who oversees similar programs in shelters and community centers. MANUEL BAGORRO: People have come together. They play together. They negotiate artistic decisions. They sort out problems but all with enormous affection for music. LUNDEN: And those are skills that inmates can use on the outside. Danny (ph) was released from Sing Sing three and a half years ago after seven years in the prison system. He learned the violin and started writing music. DANNY: It really helped me change the way I went about any tasks that I was looking to accomplish and the ability to set a goal and the desire to accomplish goals. And I was able to take that same drive and the same dedication that it takes to learn a musical instrument and to compose into other areas of my life. UNIDENTIFIED MAN #1: Why don't you play this down an octave? KENYATTA: It is the most transformative thing I've experienced. LUNDEN: Kenyatta (ph) has been incarcerated for 23 years. He's gotten a bachelor's and a master's degree in divinity and has given a TED talk from Sing Sing. He's been part of the music program since it started and says the craft he's learned has helped him open up to others. KENYATTA: So that is a message that you can receive. And then once you receive it, then I can be a little less alone because I know you understand some part of me at least. And you can be a little less alone because you know that I understand some part of you. And this really has been pivotal in helping me. LUNDEN: And it's helped him become an admired songwriter among his fellow inmates and teachers. KENYATTA: (Singing) Can't we agree there's something wrong if I feel the need to scream my life matters? And why in the world to you does that feel like an accusation? And how many guns does one man need? And how many children have to bleed and die before we concede this math, it ain't adding up right? But I'm holding out hope. LUNDEN: Kenyatta will be eligible for parole next year. For the members of the workshop who have been released from Sing Sing, Carnegie Hall hosts a monthly meeting. It's moderated by jazz trombonist Chris Washburne. CHRIS WASHBURNE: We're just beginning. And I'm trying to tell these guys, let's think as biggest possible. So our next goal is to write a bunch of music and take it back into the inside and make a real musical connection from the outside to the inside. We'll play their music, they play ours. We all come together. These guys want to go back in and give back and see those people that they formed such strong connections with. And so that's the next dream. UNIDENTIFIED SINGERS: (Singing) There's a time when you feel most tired. Hold on. Transcript provided by NPR, Copyright NPR.